One of the time honored rituals of the American fast food experience is dropping a nickel or quarter into the colorful counter-top coin game at Taco Bell in hopes of scoring a free soft or hard shell taco. Most people think of this diversion as a harmless way to kill a few seconds while waiting for their food. The chances of winning may seem slim, but the money goes to charity, so this is a painless way to donate some pocket change to a good cause. 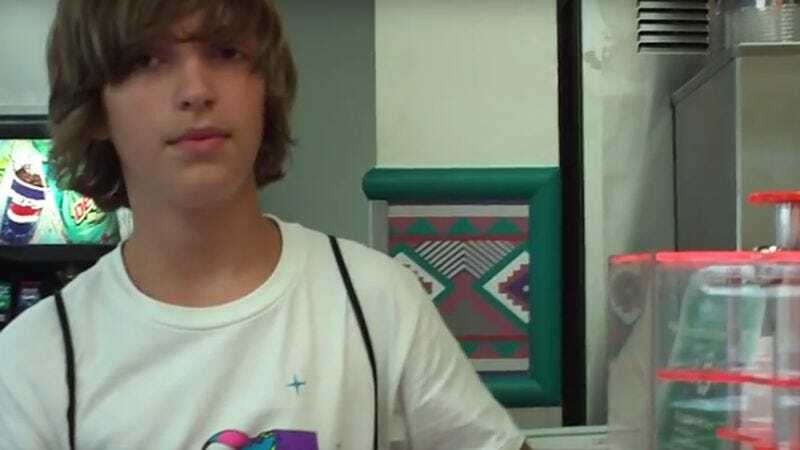 As revealed by Elijah Watson in The Daily Dot, however, one floppy-haired young man took the Taco Bell coin game as a personal challenge and set out to defeat it. In order to educate his readers and allow them to score free tacos at the expense of a corporate behemoth, Watson has dredged up a wobbly 2008 YouTube clip called “Taco Bell Trick Tip,” posted to the long-dormant account of Jawa044, most of which seems dedicated to skateboarding tricks and parkour. The video’s unseen narrator is upfront about his motives in posting the video: “This is how you cheat a Taco Bell machine.” His friend, the true star of this short film, then demonstrates his can’t-miss technique. It starts with dropping a coin dead center into the second of three coin slots at the top of the machine. Once the nickel has landed safely on a see-through orange propeller, the lad then manipulates the machine’s center spindle until at last the coin rests triumphantly upon a translucent golden platform. A bleary-eyed Taco Bell employee is thus summoned forth to present the victor with a complimentary soft shell delight. Useful as it is, the video also plays rather like an excerpt from Richard Linklater’s Boyhood, suggesting a deleted subplot about the main character’s fixation on Taco Bell coin games.